………………………I was so glad to see this statement from the aging Mr. Graham. After receiving an email from my friend Anne Moe, I took a look at the Ad that Mr. Graham is running. You may see it here. The email I received said: “Dr. Graham’s office has given permission to spread this vital message far and wide. He has given anyone permission to pay to run this ad in their local paper or to pass out at church, etc.” The Ad ran yesterday in the Wall Street Journal and will run in other large papers in the coming days. 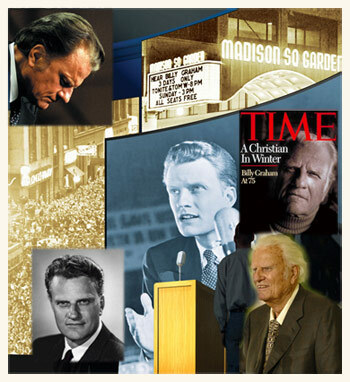 A couple of years ago, I wrote a post titled “WHAT HAPPENED TO BILLY GRAHAM?” You can see it here. It has been in my top ten posts several times. Mr. Graham has gotten criticism, some deserved and some not, in the past several years. It is a wonderful thing to see him make such a statement. I hope it has some impact on the coming elections. This entry was posted on Friday, October 19th, 2012 at 5:48 AM and is filed under Commentary, News. You can follow any responses to this entry through the RSS 2.0 feed. You can leave a response, or trackback from your own site. Mr. Graham has said what needs to be said while others are silent. I fear they are concerned about their 501C’s. Your previous article is well said and right on. I hope so, too. If only all of our preachers would say what Mr. Graham has printed. One can say Mr. Graham’s words in a church and have no difficulty keeping their tax exempt status. They are so afraid of losing their 501s as you have written, and for no reason. And it really shouldn’t matter. If churches had to lose their 501s in order to preach the truth then so be it. My pastor has preached this from the pulpit and the congregation knows how he feels. This whole thing fits so well with your new post that talks about the root of evil. i agree with your statement. Glad to hear your Pastor tells it like it is. How refreshing and inspiring. Thanks Manny. What is so great is that the man’s congregation, though small, stands behind him 100%. And 100% of them who are of voting age are registered to vote. Wow, i am tempted to move. Small is really important. Your words prove what should be happening in every church. Accountability, speaking the truth in love. I have a few friends online who can’t find a good church where they live. One family is having church in their own home. I am fortunate to attend two different churches, the one I described to you and another where I received the most petition signatures of any church in the county in an attempt to keep children out of homes with two mommies or two daddies. I go back and forth and consider my pastor to be the man at the smaller church. I am fortunate to know several men who would have no problem losing their 501 if that’s what they had to do to preach the truth. Men like this are becoming more difficult to find.